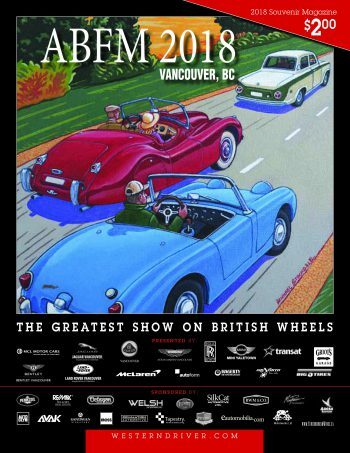 Thanks to all who attended the 2018 Vancouver ABFM and made this The Greatest Show on British Wheels for the 33rd year in a row. Photos: Michael Stockdale. Adam Langelier, 2018 recipient of Edd Award. 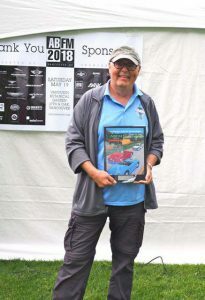 Edd Award: in memory of long-time volunteer Edd Langelier, who worked every ABFM from the beginning. 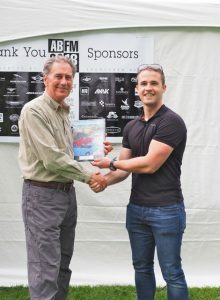 Awarded to: A second-generation Langelier family member, Adam Langelier, who has attended the ABFM from his infancy and later assisted his father with various volunteer positions, including marshalling at this year’s event. Nigel Matthews, 2018 Lewie Award recipient. Lewie Award: in memory of Lew Lewis and in recognition of a person who has contributed significantly to the classic car and automotive industry. 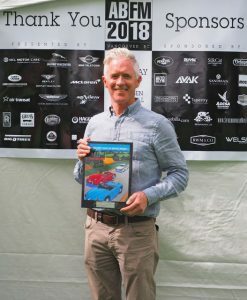 This year’s recipient is Nigel Matthews, who for 25-plus years continues to be a considerable influence in the classic car world, both locally and internationally. Matthews has been a concourse judge at many prestigious venues, including Pebble Beach; Pinehurst; Cartier Collection’ La Jolla, San Diego; and Hershey. His talents are recognized internationally as he travels annually to judge concourse events in Australia, India, Florence and England. Matthews was born in England and has lived in Vancouver for 43 years, where he worked as a Red Seal auto technician and a member of the Guild of master craftsmen, repairing Rolls Royce and Ferrari vehicles. For the past 23 years, he has been in the classic car insurance business as manager of ICBC’s collector car division and then moving on to his current dream job as global client service manager for Hagerty. 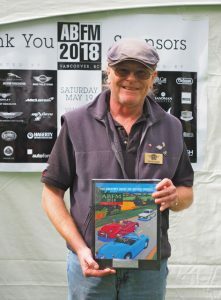 Motoring Mouth Award: in memory of Michael Powley and recognizing the spirit of a true British classic car enthusiast—hard to explain, but instantly recognizable. 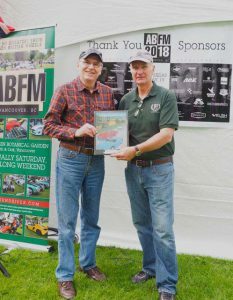 Regrettably, this year’s recipient attended his very last classic car event at last year’s Vancouver ABFM. 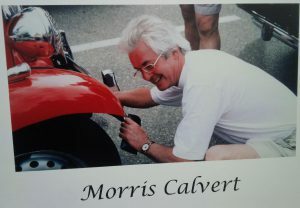 Long-time friend and fellow ABFM judge Morris Calvert awarded posthumously the Motoring Mouth trophy in recognition of his dedication to a lifetime of support to the classic car hobby in BC and Alberta. 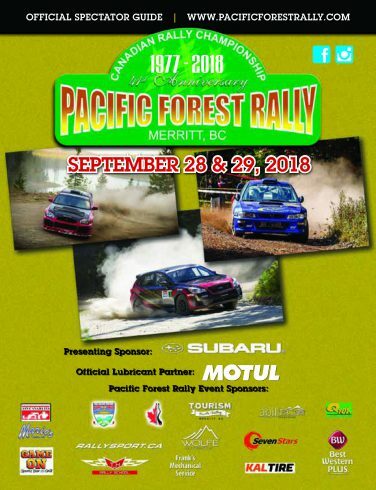 Thanks to the team of hardworking and unbiased judges under the direction of Nigel Matthews and John Allen: Ken Miles, David Gilmour, Calvin Ast, Cedric Carter, Brendan McAleer, Ted Laturnus, Wes Stinson, Ed Tretwold, Jim Hilton, Kellen Voyer and Martin Phillips. Jonathan Parker, Best Original, Unrestored vehicle. Best Original, Unrestored Car, sponsored by Shell/Pennzoil, with thanks to brand manager James Taylor. Original, Unrestored is defined as “Close as possible to factory, original condition.” Vehicle must be 1988 or prior. Winner: Jonathan Parker from Vancouver, BC. 1966 Austin Vanden Plas Princess, Saloon, Grey. Judges’ Comments: Everything about this vehicle is original–tools, paint and interior. 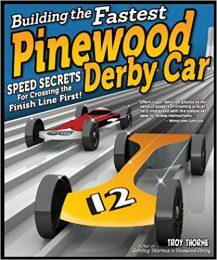 Geoff Chrysler, Best Debuting Restoration Under $50K. Best Debuting Restoration, under $50,000 spent, sponsored by Octagon Motor Group, Cam Lusztig presenting. Judges’ Comments: A do-it-yourself restoration to a very high standard. Trevor Parker, Best Debuting Restoration $50-$100K spent. Best Debuting Restoration, $50,000-$100,000 spent, sponsored by Griot’s Detailing Products, distributed in B.C. by Dealer’s Edge, Langley, Les Varnai presenting. Judges’ Comments: An absolutely stunning restoration. 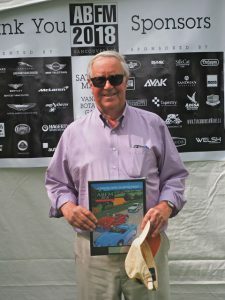 Best Debuting Restoration, more than $100,000 spent, sponsored by BMC Motorworks and presented by David Gilmore, owner and master mechanic. Stephen Plunkett, Best Debuting Restoration, more than $100K spent. 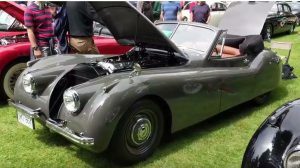 1953 Jaguar XK120, winner Best Debuting Restoration, more than $100k spent. Winner: Stephen Plunkett from North Vancouver, BC. 1953 Jaguar XK120, Drop Head Coupe, Grey. Judges’ Comments: 34-year, complex restoration project by a professional shop, Legend Motors, in Ontario. The car was driven the next day on the ABFM Whistler Run, where it drew a crowd of spectators. 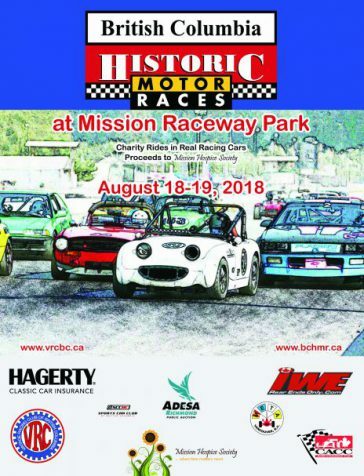 New cars at the Vancouver ABFM represent the faith in the future of this event and the classic car hobby and this year, close to one-third (156) of the cars were new to the event. 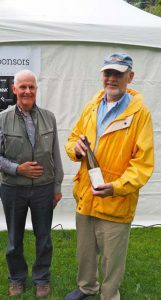 John Dickinson (left) Synchromesh Winery presented the First-Time Entrant award to Dana Ferguson. 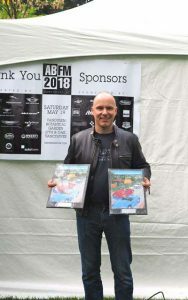 First-Time Entrant Award, recognizing the best car at its first-ever Vancouver ABFM, sponsored by Synchromesh Wines, owned by classic car enthusiasts Alan & John Dickinson. Best First-Time Entrant: 1971 Jaguar E-Type. Winner: Dana Ferguson from Victoria, BC. 1971 Jaguar E-Type, Convertible, Dark Blue. Judges’ Comments: A beautifully done BC restoration. The car was also entered as a debuting restoration, more than $100k spent. Young Entrant Award: recognizing owners 35 and under, sponsored by Silk Cat Automotive Specialists. Winner: Hugh Grady, Vancouver, BC, for his 1980 MGB, Roadster, Brown. Judge’s comment: Original car, which Grady works on the mechanics with his father. Sold originally in Vancouver by Gordon Bros.
McLaren Vancouver brand manager Shaun Donnellan (right) presents George Streadwick with his award for Best Modified car. Best Modified Car Award: recognizing the increasingly popular performance class cars, sponsored by McLaren Vancouver. Special thanks to brand manager Shaun Donnellan for bringing out the latest McLaren supercars. 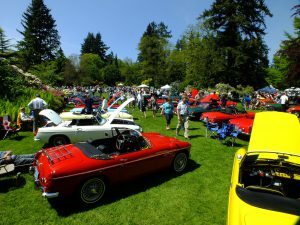 Winner: George Streadwick, West Vancouver, BC, for his 1977 MGB, Roadster, Blue. Judge’s Comment: V8 conversion, five-speed with Rover type V8. More effort than just an engine swap! Jaguar rear suspension conversion, 5-lug Jaguar hubs. Nigel Matthews, global client service manager Hagerty (right), presented the Featured Marque Award to James Stait. Marque was the Austin Healey Mk 1 ‘Bugeye’ Sprite, of which there were 12 on the field, including two debuting restorations. Winner: James Stait, Vancouver, BC, for his 1958 Austin Healey Mk 1 Sprite, Convertible, Green. 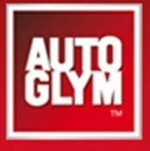 Land Rover was celebrated all around the world this year for its 70th anniversary and was also a Featured Marque, sponsored by Autoglym. 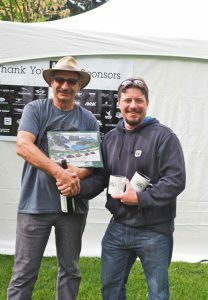 Martin Rothman (left), winner of the LR70 Featured Marque Award and Land Rover Spirit Award, presented by Rovalution’s Don Macdonald. 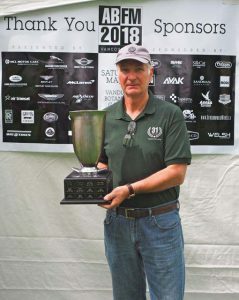 Winner: Martin Rothman, from Surrey, BC, for his 1952 Land Rover, Series 1, Green. Rothman’s Land Rover S1 hardtop was originally sold by Plimley Vancouver in 1952 and like a true “Farmer’s Friend” was shipped to Penticton to work the orchards, where it stayed until 1973. In 1996, it underwent a ground-up restoration. Darcy Edgecombe, a double-winner in Motorcycle Class. 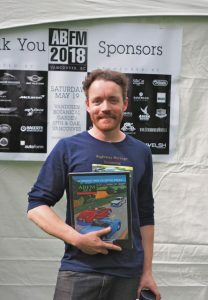 Best Motorcycle Overall, sponsored by the British Motorcycle Club of BC (BMOC), awarded to Darcy Edgecombe for his 1954 Triumph Tiger 100, blue. Edgecombe also won the Best Featured Marque, celebrating 70 years since the debut of the Triumph Speed Twin, presented by Western Driver. Judge’s Comments: This Tiger 100 is a pristine restoration, even down to the original stencils. 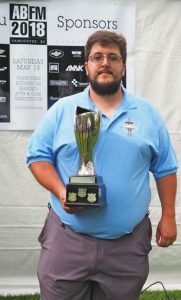 Phil Sandham, 2018 ABFM Long Distance Driver from Regina, Saskatchewan. trailered, to the show and identifies a certain character in the vehicle’s owner. 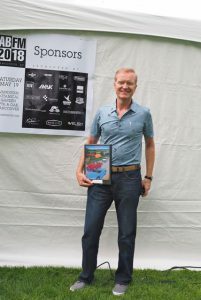 Thanks to Lotus Vancouver and Mike Wood for sponsoring this award. Winner: Phil Sandham, who drove his red 1969 Jaguar E-Type from Regina, Saskatchewan, 1,732 kilometres to the show. Well done! Sandham also participated in the next day’s All Brit Whistler Run, a trifling 114.3-kilometre drive from Park Royal. Leo Chow, Neatest Little Car winner. His other car is a 2002 MINI Cooper S.
1958 British BMW Isetta bubble car. Neatest Little Car, recognizing the cutest small car on the field as voted for by ABFM entrants, sponsored by MINI Yaletown. 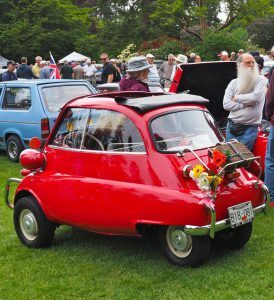 Winner: Leo Chow, Vancouver, BC, for his 1958 British BMW Isetta microcar. In 1957, Isetta of Great Britain began producing Isetta 300 models under licence from BMW. The company stopped production of the little cars in 1962 but continued to produce Isetta engines until 1964. 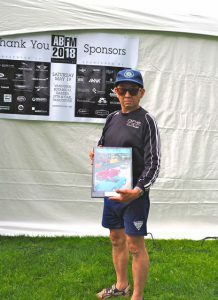 Chow drove his 2002 MINI Cooper S on the next day’s Whistler Run, since it would have taken about a day-and-a-half or longer to get there in the Isetta. John Waite, winner of the Most Elegant Car Award. Most Elegant Car on the field as voted for by ABFM entrants, sponsored by Rolls Royce Vancouver. Winner: John Waite for his 1929 Rolls Royce Phantom 1, Tourer, Black & Burgundy. The Rolls-Royce Phantom was Rolls-Royce’s replacement for the original Silver Ghost. Introduced as the ‘New Phantom’ in 1925, the Phantom had a larger engine than the Silver Ghost and used pushrod-operated overhead valves instead of the Silver Ghost’s side valves. Special thanks to Rolls Royce Vancouver’s product manager Steven Wu for displaying the 2017 Ghost at this year’s show. Craig Wallace, Entrants Choice Overall winner. Entrants’ Choice Overall, recognizing the car that most ABFM entrants wanted to drive home, sponsored by MCL Motor Cars, Dilawri Group of Companies. 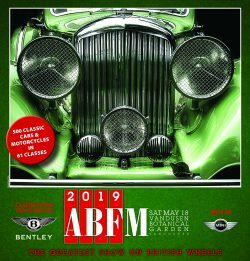 MCL is the ABFM’s longest supporting sponsor and represents four British-built brands: Aston Martin, Bentley, Jaguar and Land Rover. 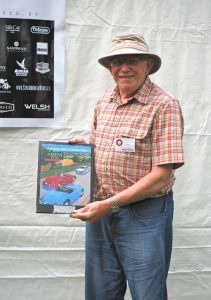 Winner: Craig Wallace, Vancouver, BC, for his 1964 Aston Martin DB5, Saloon, Silver. See you all next year, Saturday May 18, 2019, and here’s to safe and happy motoring.